We are sharing an list of awesome gift for a 1 year old boy and we are sure you will find just the right idea for your little one or for a 1 yr old son of a friend or family member. We have compiled this “best of” list featuring quite a few mom and dad approved gifts, bearing in mind kids will have these for a while, and that these are also parent friendly (not too loud). All picks being appropriate for 1 to 2 year olds and beyond). 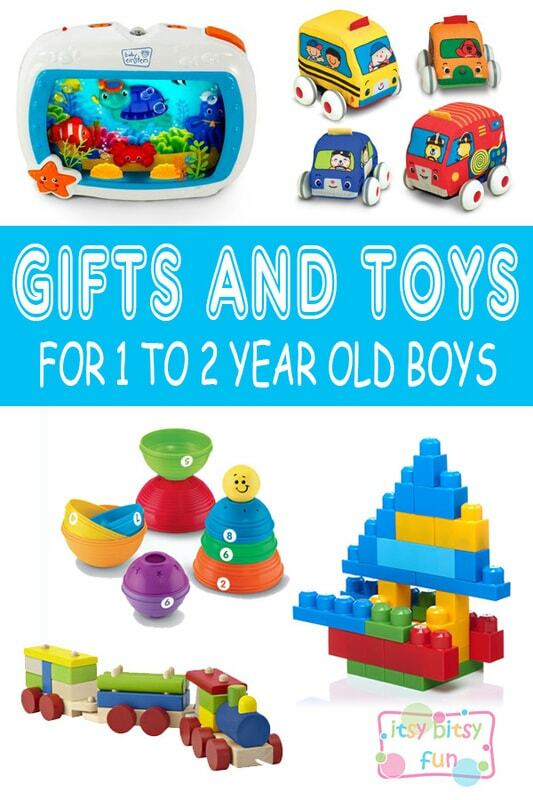 Toys and other gifts appropriate for 1 to 2 year old baby boys! We were dedicated to picking just the right toys and by that we mean the toys that are truly beneficial and have that extra value, either by helping with physical skills or mental development. Most of these are gender neutral however we made sure this list contains more toys that are considered boyish and therefore it’s called “for boys”. For those of you that want to go the cars and tools route. ​And while we were at it we also created a best gifts for a 1 year old girl list (if you want something with a splash of pink, and naturally a general list of gifts for 1 year old. We’ve reached a consensus! Building toys that allow open ended play are awesome. Kids love them and they are great for their development. You can never go wrong with these, especially if you are getting a present for someone else’s son. No fear with buying the exact same thing as someone else as even if you do it only doubles the fun. 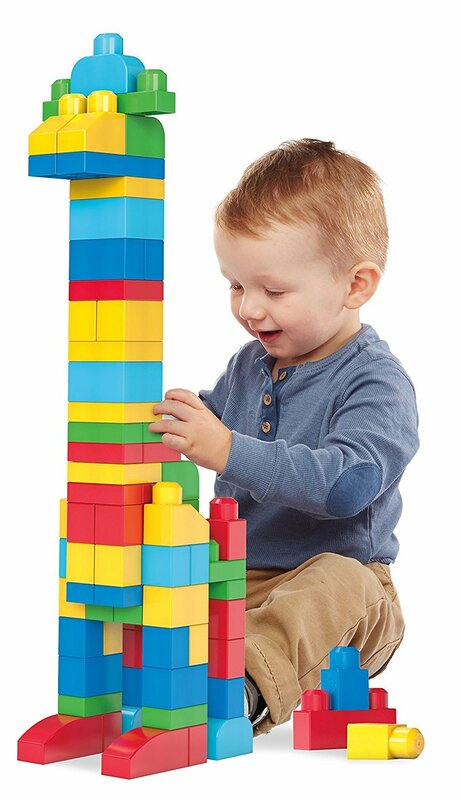 Building blocks are a must. Really. These will entertain them for hours and years to come. These are great for so many different reasons they allow open ended play, let the kids be creative… They make a great fine motor exercise. What is probably the best thing about these, especially if you are attending a birthday party and don’t know what others will bring to that one special 1 year old there’s no going wrong with these, even if someone else buys them too. The more the merrier! According to my mother stacking cups was my favourite activity and I would easily stack them for hours (giving my mother a chance to get her well deserved rest). In all honesty I haven’t yet seen a 1 year old (or a bit older) who wouldn’t enjoy these. This Sea Dreams Soother is something I’ve come across in the store and instantly fell in love with! This calming device plays soft music, lights up with dim light and makes the ocean go alive (ocean animals start moving). 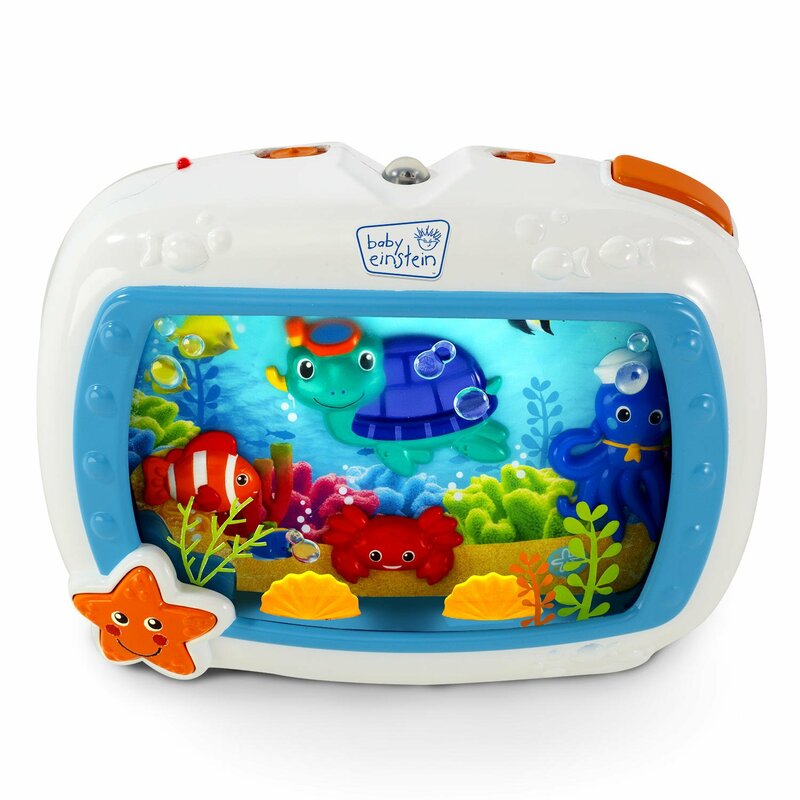 It has 4 different modes – you can have it just play the music, just lights and motion, just the ocean sounds (super calming) or all things together. One of mom favourites. 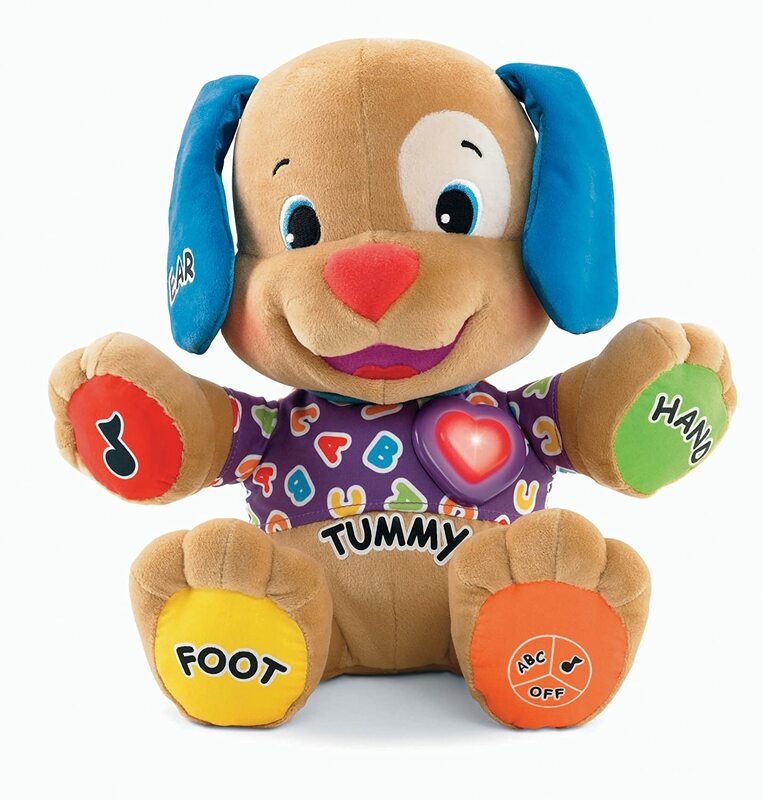 This toy plays 7 classical melodies. General experience with this toy is that babies can’t get enough of it (and music is pleasant to the ear). The handle is easy to hold so they are usually taking it along with them as they wobble about. You can set the music volume which also makes this one a parent friendly toy :). A wonderful pick babies will fall in love with. 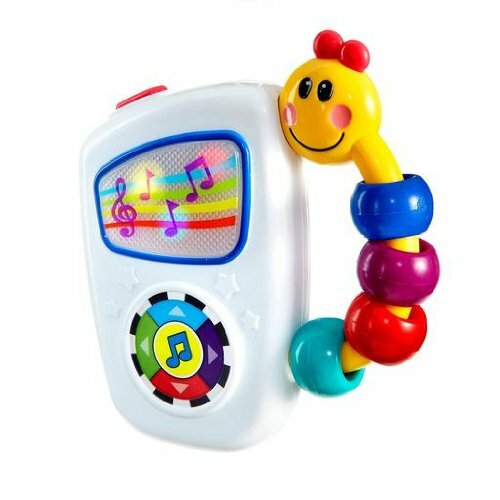 This interactive toy sings songs, talks and is fun all over. It has a calm voice so it’s a parent friendly choice. Something to Help Them Get on Their Feet! When babies are 1 year old most of them have already taken a step or two and they are trying their best to get on their feet by themselves. This learning walker will help them out as they will have something to hold on to (other than furniture) as they practice their left, right, left, right. 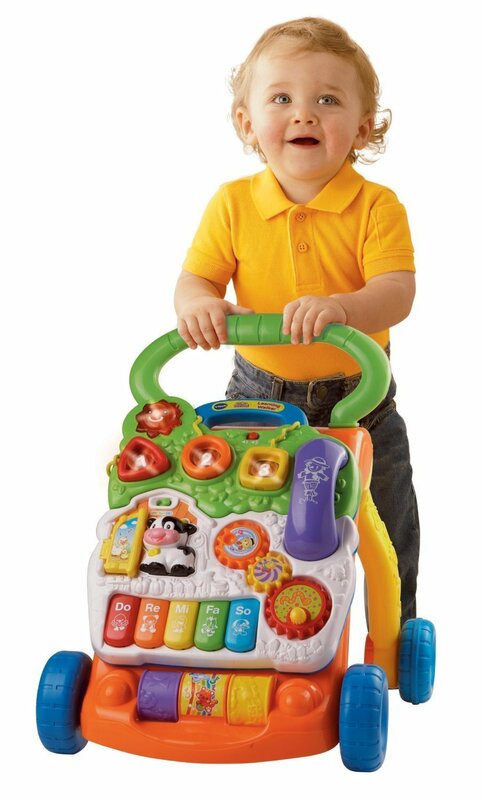 As this toy walker has a lot of other activities (piano keys, telephone, spinning rollers…) it will entertain them even after they are stable on their feet. Why Not Get a Book for a 1 Year Old! Books always make great gifts and it’s never to early to start gifting them. 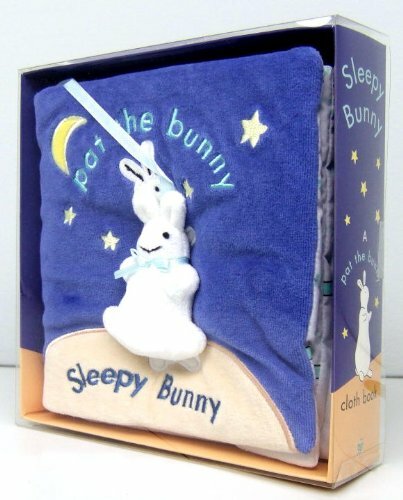 I love Pat the Bunny, and Sleepy Bunny is a cloth book inspired by Pat the Bunny. Boyish Toys – 1 Year Old Boys Will Love These! By no means exclusive to boys… But still when you think about “boy things” things that generally come to mind are blue color, cars, tool kits, trains and such. And here are a few great ones. Did you know pull back cars like these even existed – we all know about the regular metallic and plastic ones but plush ones? Who knew? 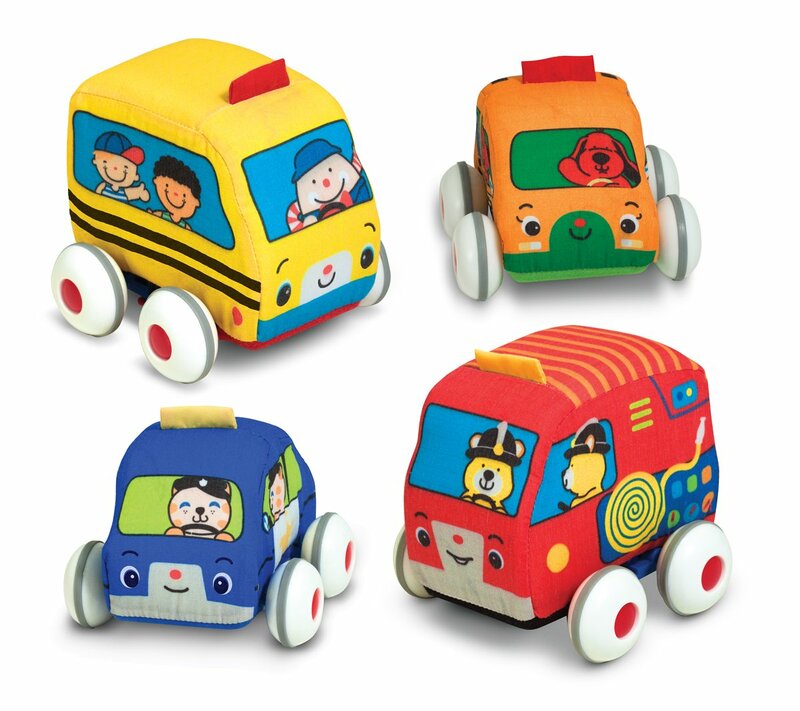 This set includes 4 super soft vehicles (a bus, a family car, police car and a fire truck) and they all have detachable wheels with pull back mechanism (so the baby can play with soft plus vehicles only too). Mastering the grasping and pulling back is a big deal for them and once they master it they will love watching the cars drive across the living room. Something to be just like daddy (or super mommy!). 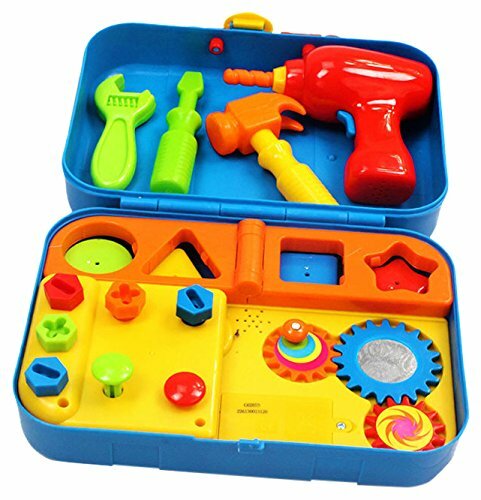 I personally think this set is beyond adorable and as there are so many fun things you can do with this toolbox I think there isn’t any 1 year old boy out there that wouldn’t love it! There’s just something special about wooden toys. They just feel more natural (well maybe because they are). 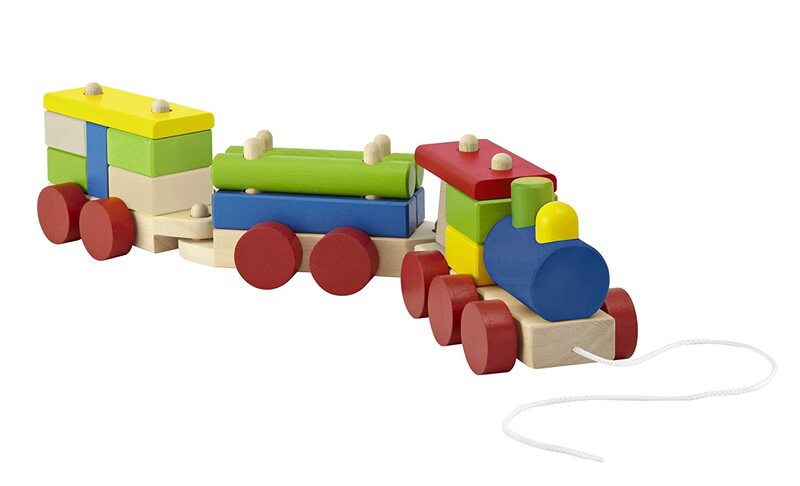 I’ve bought quite a few of these in the past and they were always well received (not just wooden trains, other wooden toys too) as they are pretty and allow open ended play. However there is one thing that I would recommend doing before giving these kinds of toys – inspect them. They are fine 99.9% of time but could have an edge or an imperfect surface that needs a bit sanding. I should also note that different manufacturers have different age recommendation (for 1 or for 2 year olds).